These used Vitra White Square Meeting Tables would add a touch of class to any meeting room or breakout area. Designed by the iconic Charles Eames, these square meeting tables feature the classic segmented base with a white top and an elegant solid black edging. 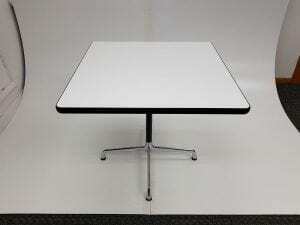 We also have matching Vitra White Round Meeting Tables (as well as a lot of other Vitra products! ), in stock, so please cast your eye over these too! Please contact one of our sales team on 07944 508282 for more information. Alternatively, if you are viewing our website on a mobile device, you can click on the Telephone Icon located at the bottom of this page. You can also enter your details into our Request a Quote Online Form and one of our sales team will be in touch to assist you further. If you were unable to find the products you were looking for, why not take a moment to view our complete range of Second Hand Tables that we currently have available in stock by clicking on the link that has been provided in this paragraph. These tables can be viewed in our showroom along with all our other used office furniture. Designed by Charles Eames, complete with a Segmented Base, White Top and Solid Black Edging. Dimensions: 800 x 800mm.